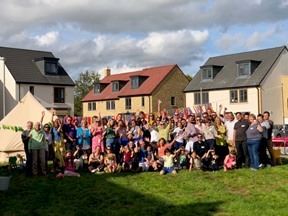 Residents of Newland Homes’ The Old Nurseries development in Frome have held a garden party on the green. Organised by resident Lucinda Gardner, over 100 people came and enjoyed food, drink and games in the last of the summer sunshine. Lucinda said: “It was the lovely green space in the middle of the development that first attracted us to The Old Nurseries. I saw the potential for street parties and a space for children to play. The street party was also driven by my son Sam who wanted to help with the organising. “I mentioned it to Diana, the sales advisor, who was incredibly enthusiastic and supportive and it just gathered momentum from there. One neighbour designed the invitation, another set up their bell tent for a children’s area, other neighbours fired up their barbies and everyone brought a dish to share, something for the barbie and to drink. Frome Town council were also a huge contributor to the success of the event, lending us all manner of things from tables and bunting to a bicycle that makes smoothies! The YMCA lent us giant garden games and the Share Shop lent us a popcorn maker, more games and bunting. For more information on The Old Nurseries, click here.